The Assistant Accountant Level 3 Apprenticeship is for businesses who require existing employees or new recruits to be formally trained and qualified in accounting practices, in order to undertake day to day financial activities or be involved in regulatory financial requirements. Below is a video where we spoke to Apprentices Sam and Olivia as well as their manager Will about the Accounting Apprenticeships at My Accountancy Place. Typical job roles for this accounting course include: Accounts Assistant, Finance Assistant, Accounts Technician, Purchase Ledger Clerk, Sales Ledger Clerk and Assistant Accountant. This Apprenticeship has been developed by employers and specialist Awarding Bodies to ensure that employees that work within these job roles develop all the skills, knowledge and behaviours they need to confidently perform all routine financial transactions. Learners can gain their qualifications through one of two learning routes. Classroom learning or online learning with support. All learners receive comprehensive learning materials which include study and training packs, revision guides, pocket notes and mock tests. Classroom sessions are run every week at our training centre in Manchester, whilst online sessions are run once per month. Learners have access to real time online sessions where they can interact with tutors and access the recorded sessions afterwards. Learners choosing this type of learning method need to be well-disciplined students who can allocate 3 to 4 hours per week to studying the materials provided. Very experienced team of trainers and coaches who are all AAT qualified themselves and have worked within industry or private practice for many years. High level of personal support – all learners are allocated their own personal coach. All our coaches are very approachable and available at short notice to support all learners with any needs they have. Following completion learners can progress to the Level 4 Professional Accounting Apprenticeship which incorporates the Level 4 AAT Professional Diploma in Accounting. Employers paying the apprenticeship levy can use their funds to pay for this programme. Smaller organisations with an annual payroll bill of less than £3 million per year, will need to contribute 10% towards the cost of this programme. The rest will be paid for by the UK government. For more information please click on the link below or call us on 0161 200 1673. 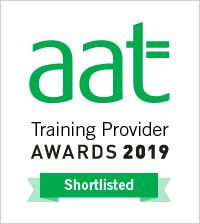 The Apprentice Academy have been shortlisted for both the Medium Training Provider of the Year and the Apprenticeship Provider of the Year awards with AAT!